By 2019 I, my family and 3 million other people will know their fate. Until then, 3 million lives will be subject to persistent anxiety, uncertainty and tumultuous emotions. More than 700 days will be spent before any glimpse of hope and certainty is going to become reality once again for millions of people who have made the United Kingdom their home – their only home… These 3 million people work in the NHS and other public services, they clean streets and shops, they operate businesses and build homes and they teach at schools and lecture at world-class universities. Yes, they are the 3 million nationals from the European Union who have settled in the UK and actively contribute to its economy, culture and its way of life. The anxiety, uncertainty and turbulent emotions could have been eliminated more than a month ago. However the House of Commons and the House of Lords emphatically failed in amending the ‘Article 50 Bill’. The amendment to secure the rights of EU nationals living in the UK was observed closely by thousands of people at every step of the way: from the MPs to the Peers, then to the MPs and then to the Peers again. But, to what avail? Only to be disappointed, heart broken and to be reminded again that we, the EU nationals living and working in the UK, are powerless and not welcome. Regardless of how many words of reassurances David Davis MP utters at the dispatch box – they will never be enough. It is the legality of words which holds importance in the 21st century and not the degree of warmth with which they are uttered with. Promises are of no importance since the EU referendum campaign. All ‘leave’ campaigners, from Andrea Leadsom MP to Gisela Stuart MP argued that the rights of EU nationals living in the UK should be protected. However, when it came to the amendment, they emphatically voted against it. People should not be used as bargaining-chips, people should be treated as people regardless of their nationality. Human lives are not a political game. It is deeply depressing to think that there are people in the highest ranks of the Conservative government who think that millions of lives can be used like chips. Those abhorrent individuals must understand that they are dealing with the future of millions of people. 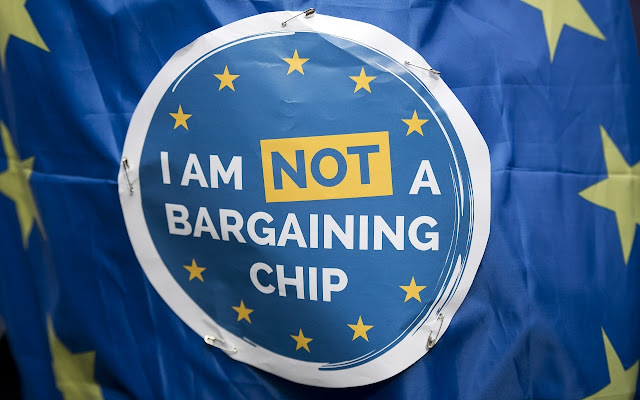 Boris Johnson, Liam Fox and David Davis should grow up and stop treating the lives of 3 million people as if they are bargaining chips in an imaginary card board game for 5 year old kids. The current climate is not just the fault of the Westminster establishment. As an EU citizen in Britain, I profoundly understand and sympathise with the likewise situation of British nationals on mainland Europe. Therefore, the European Council and the European Parliament are just as blameworthy as the Brexiteers for creating a climate of uncertainty for millions of people living on both sides of the English Channel. Donald Tusk, Angela Merkel, Guy Verhofstadt are complicit in causing unease and confusion for countless citizens. Prime Minister, Theresa May, offered to settle this matter months ago; however, the European Union declined. It is sickening and agonising to see that Guy Verhofstadt MEP is attempting to portray himself and his fellow bureaucrats as the saviour of people’s rights. Where was he when Theresa May was ready to negotiate this vital matter months ago? This has been a perfect example of the political class acting out of touch with the needs and wants of the people. It has proven once and for all that politicians, regardless of their political ideology, act to advance their personal and selfish interests at the expense of millions of hardworking people. The disparity between the governing and the governed is too immense for this relationship to be reconciled. No lessons have been learnt by the Westminster establishment and the Brussels bureaucracy from the political upsets of 2016. New leaders, new politician, in fact a brand new system is needed. A system which would keep elected representatives under the close watchful eye of the electorates. A system where politicians act to minimise uncertainty for their constituents rather than increase it. Brexit is not a divorce between the UK and the EU; it is a divorce between out-of-touch politicians and the electorates. I am sorry to say that this article, although written well, goes along the same narrative and is under-researched. Have a look at Article 71.1b of the Vienna Convention on the Law of Treaties (1969), which has been ratified by the UK. It protects people who have received rights (staying in an EU country) conferred to them in a Treaty (Treaty for Functioning of the EU, in that rights cannot be taken away retrospectively - if not properly researched, this is pure scaremongering. The government knows this and is keeping quiet because it needs to take a strong stance in negotiations - but it is simply not possible to deport Stasi-style all EU immigrants. Secondly, the Bill you are talking about was merely to notify the EU of withdrawing from the EU - that is not the time for anyone (and the Lords knew full well that this was the case) to propose specific amendments. The Great Repeal Act will be debated for such a long time in Parliament; that is the place to address your worries and add amendments to the final package of withdrawal.